Shovel shingles industrial quality roofers. Serrated hollow back tempered steel plate welded to the back of the blade serving as a fulcrum. Footrest backwards ash handle varnish grade. Limited lifetime warranty. The Fiskars Pro Transfer Shovel features ultimate durability, making it ideal for moving mulch, wood chips, fertilizer and more. An extruded aluminum handle ensures superior strength, while double-bolted connections guarantee the tool will not come apart. 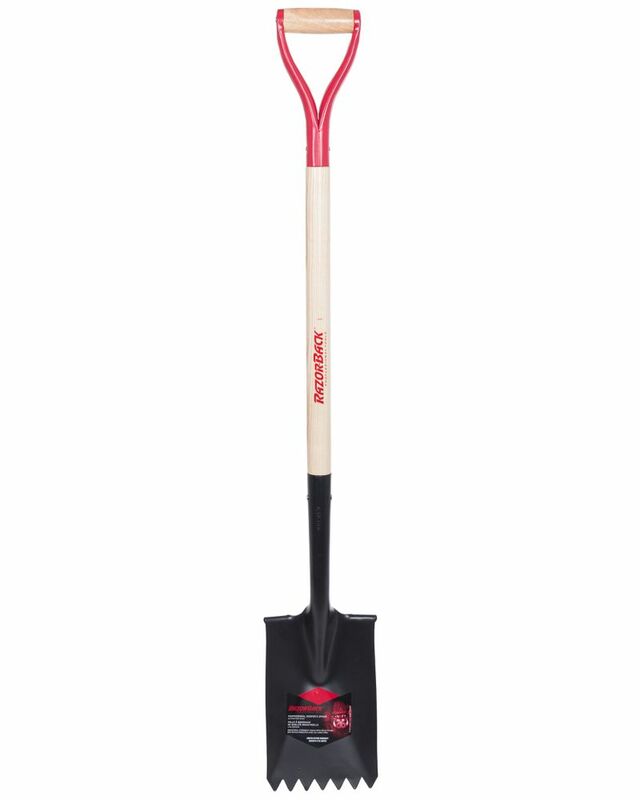 The heavy-gauge spade stands up to any task, while a large step provides more stable footing. A teardrop-shaped shaft better fits the contours of your hand and is optimally angled for transferring heavy loads. Additionally, Softgrip touchpoints on a high-visibility handle enhance comfort and control, as well as reduce repetitive fatigue. The simple, heavy-duty construction of this shovel makes it a reliable choice for daily, quality performance under all conditions. Garden Care garden spade with forward-turned steps, tempered steel blade, reinforcing steel collar and ergonomic poly grip. The narrower blade makes it perfect for digging and preparing garden beds, and for mixing soil, compost and peat moss. Roofer Spade, Razor-Back Shovel shingles industrial quality roofers. Serrated hollow back tempered steel plate welded to the back of the blade serving as a fulcrum. Footrest backwards ash handle varnish grade. Limited lifetime warranty.